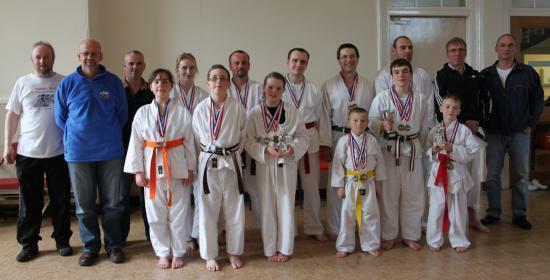 On Saturday 6th April 2013, Karate students from across the County took part in the clubs annual Kata & Kumite Competition in Wick Assembly Rooms. Competitors ranged in ages and grades from 6 year old beginners to adult brown and black belts. The event provided a welcome break for club members who have recently been training for the upcoming grading examinations to be held in May this year. It is hoped to organise a special event next year to mark the clubs 30th anniversary. There were two main events for each age category. Kata (or formal) training, and Kumite (sparring). Kata is one part of the syllabus practised in the Japanese Martial Art, where the individual completes a series of prearranged fighting sequences. Kumite is where individuals demonstrate their ability to respond to attack and defence techniques. There were 3 age groups in both the Kata and Kumite sections of the competition: 6 -9 years, 10 � 13 years and senior (over 18). There were also trophies for best junior girl, best junior boy and a cup for best overall competitor. The photo shows all the medallists and trophy winners along with the Thurso and Wick clubs instructors and senior grades who organised and judged the competition.